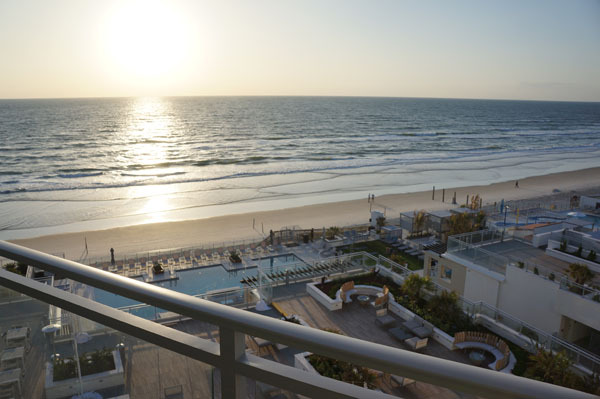 Daytona Beach is back with a bang! 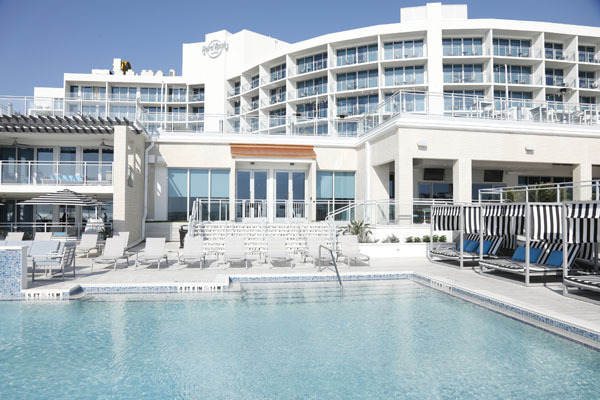 The legendary beach town with the iconic race track now has a brand new Hard Rock Hotel, built on an iconic mid century beachfront property. 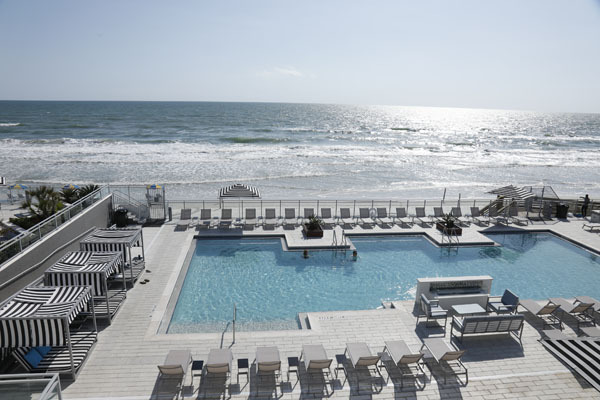 Hard Rock Hotel and Daytona Beach is a match made in Rock ‘n’ Roll heaven, and even a short stay there will make you realize that it lives up to these expectations. How cool is it when you check in and find a legendary Fender telecaster guitar along with an amplifier and headphones in your hotel room? This is part of Hard Rock’s signature The Sound of Your Stay(TM) music amenities program. It allows guests to set the mood with vinyl records or jam out on a Fender guitar in the privacy of their own room. You can also download music playlists curated by favorite artists and taste makers. 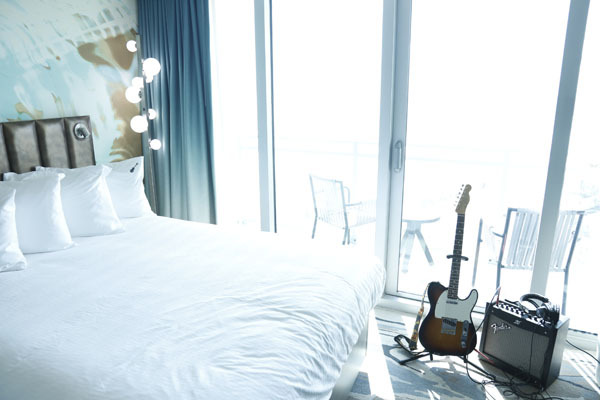 After you have spun some vinyl records or shredded on your guitar, you might want to take a stroll through the beautifully designed hotel with a distinct modern mid century feel to it. The hotel staff you encounter is extremely friendly and courteous. They almost give you the feeling that you have hung out with them before at rock concerts. 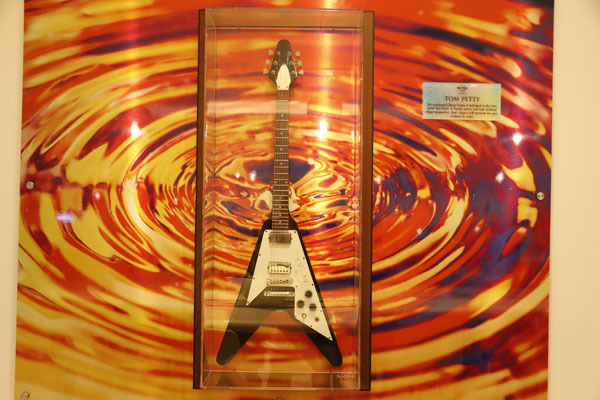 At the centerpiece of every Hard Rock Hotel is the music memorabilia in the lobby and hallways. There are many iconic outfits and musical instruments of legendary artists presented behind glass. From Jimmy Hendrix’s suede shirt and bell bottom pants, Tom Petty’s Flying V guitar to Rihanna’s futuristic latex outfit. There are so many awe inspiring and legendary pieces that a stroll through the hotel becomes an amazing walk through rock and pop history. It is mind blowing to think that the worldwide Hard Rock Cafe and Hotel brand, now owned by the Seminole Tribe of Florida, started with a tiny little underground cafe in London in 1971. After you gazed long enough at the treasures inside the hotel it is definitely time to enjoy the outdoor areas, including the stylish pool. If you are hungry or thirsty, you can enjoy the panoramic views of this world famous stretch of coastline from the Wave Terrace deck or Sessions restaurant. One very special treat is definitely the Rock Spa. More Zeppelin than Zen, the signature Rhythm & Motion menu offers the world’s first fully immersive music-centric spa treatments that utilizes amplified vibrations, pressures and patterns. This groundbreaking experience takes guests on a rhythmic massage journey. Bass vibrations ripple through the massage table as treble beats come from above, sending pulses through the body leaving guests feeling energized and invigorated. This is the perfect energizer before one of Hard Rock’s many concerts or musical performances. In front of a beautiful outdoor stage you can rock out to world renowned bands and musical acts with the beach and waves right behind. An unforgettable experience! Adults aren’t the only ones though having fun at the Hard Rock. Hard Rock Roxity Youth Club(TM) encourages kids to get moving and participate in imaginative play with music, dancing and fun for everyone. Teens get to hang out too. With a backstage experience, complete with games, TVs, activities and music.